Starr, a female bald eagle, looks over her eaglets in a nest along the Mississippi River in April. She is raising the three eaglets along with her two male partners, Valor I and Valor II. You can tell Tolstoy that not every happy family is alike after all. Along the Mississippi River in Illinois lives an unusual family of six bald eagles. 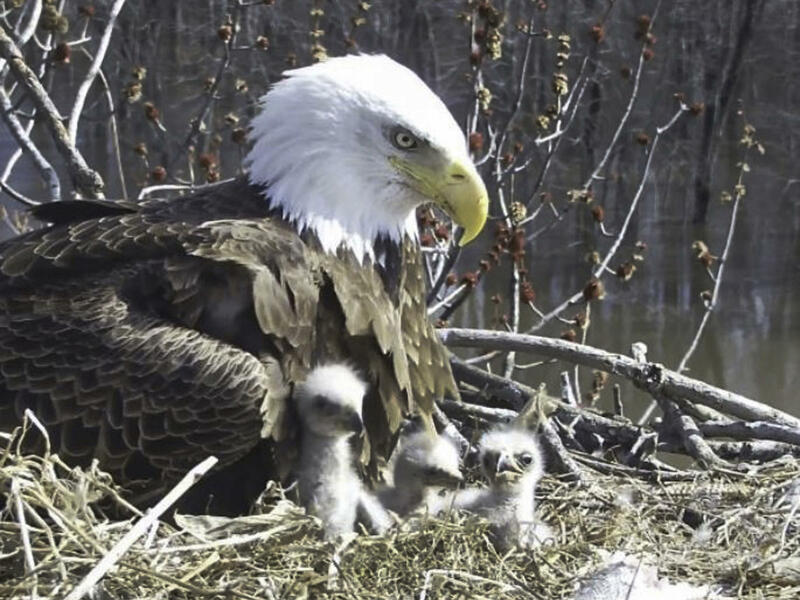 Two males and one female are caring for three eaglets — with the world watching on a livestream. The two males, Valor I and Valor II, and the female, Starr, have been together since 2017, in the backwaters of the Upper Mississippi River National Wildlife and Fish Refuge. Earlier that year the males' first partner, Hope, went missing after a violent attack by other eagles. But the males stayed together and courted Starr, which experts say is a remarkable twist to an already unusual situation — bald eagle trios have been documented before, but rarely, according to the Audubon Society. The birds saw three eggs hatch this year at the end of March and the beginning of April. The unnamed eaglets, once tiny bundles covered in soft, gray down with wobbly legs and partially closed eyes, are now getting old enough to hold their heads up for feeding. They are just weeks away from being able to walk and tear up their own food — and eventually fly on their own. And their parents are always keeping the pantry full, according to the Stewards of the Upper Mississippi River Refuge. On the menu are fish, fowl and the occasional muskrat and turtle. It's an all-hands-on-deck co-parenting situation, with all three taking a role in maintaining the nest, incubating the eggs and raising the young, according to the Stewards. As the Audubon Society writes, "Refuge biologists don't know for sure whether Valor I and Valor II have both fathered eaglets in this case, but based on the mating they've observed, the odds are good." And the trio is expected to stay together, say the Stewards, as eagles mate for life. Meanwhile in southwest Florida, two longtime bald eagle residents have recovered from nest devastation to hatch two eaglets of their own. The pine tree that housed "Vic and Nic" toppled during Hurricane Irma in 2017, according to Eagle Country, which operates the livestream of their nest. The couple rebuilt in an adjacent tree, but their nest was blown out of the tree late last year. They hustled to rebuild and laid their first eggs just over a month later. A few months out, eaglets Dandy and Spur appear to be healthy, with voracious appetites and their long, black juvenile feathers growing in. There's been no such luck for the star eagles of Washington, D.C. The National Arboretum's popular couple, Mr. President and the First Lady, haven't laid any eggs. Neither have Liberty and Justice, a pair living on the grounds of the D.C. Police Academy. Experts predict no eaglets for the two couples this year, as the brief window for breeding comes to a close, The Washington Post reports. Mr. President and the First Lady's Twitter page acknowledged the empty nest. "Who was the wise guy who said 'If you build it, they will come?' " the account tweeted. The couple lost one of their eaglets last year. The eaglet, Valor, was born in the spring and grew into a sleek, young bird, under the watchful eye of his parents and the many eyes of online eagle-watchers. But in mid-summer he fell from the nesting tree. When he was taken to a bird rescue and research facility, he was found to be severely underweight and tested positive for West Nile Virus. Researchers said it was "extremely unlikely" that he would recover, and they euthanized him in August. Valor I, Valor II and Starr have also known their share of loss. When the trio of bald eagles hatched their first eaglets together last year, one died of unknown causes before it could take its first flight. While eaglet deaths are a blow to observers, they're a relatively common phenomenon. According to the Stewards, as many as 70 to 80 percent of bald eagles in the wild die before they reach adulthood at 5 years of age. But fans are undeterred by that fragility. Just like the beloved eagles of Washington, D.C., the Illinois trio has drawn a group of dedicated fans. "Beautiful family," one woman wrote on Facebook. "I watch every day." On another night, when storms blew through northern Illinois, another commenter wrote in with relief that the family had emerged unscathed. "I was sending out prayers for them last night, when these storms were going through," she wrote. "How scary for them! God Bless them."